ON FIRE: HALOGEN LIGHTS – CAN THESE OLD SCHOOL CANDLES OUTSHINE LATEST TECHNOLOGY? ​I remember tootling around the country side in my 4x4 equipped with 100 Watt Halogen driving lights, upgrading them to a whopping 120W and 150W bulbs, melting reflectors, replacing bulbs after a few thousand corrugations and still a little unsure of what lay along the sides of the road waiting to pounce into my path. Enter HID and my trusty LandCruiser spent close to seven bright years with a set of superb 35W HID lights blazing away. Sure, I could see almost a Kay down the track, if it was straight enough for the laser like beam to cut through the mist, but I was still left a little unsure of the sidelines. Then LED rounds hit the scene; that combined with our magazine light testing which has seen close to 40 sets of lights grace the Cruiser bar saw me thinking that my newly acquired LED’s were the ducks nuts in aftermarket driving lights. Then came along FYRLYT and their crew declaring the advantages of good ol’ halogen driving lights. Not only are they suggesting their latest and upgraded version, the Nemesis 9000, are as bright as HID, but their lights were in fact safer to drive with given the light spectrum similarities they project that are similar to real daylight. With 500Watts of firepower, yep, you read right… each light packs a 250W halogen globe…, we set out with another two sets of lights (HID and LED) fitted to our bullbar to test the claims. Before we get into the lights performance, it needs to pointed out that because of the lights currant draw, we had to install a complete new wiring loom as per FYRLYT specs of much thicker wiring, two 40 amp fuses, two relays and a 12 to 24V converter. Yep, although this light kit is designed to run on a 12V vehicle, the actual bulb is a 24V unit, so requires the DC-DC step-down converter which is included in the kit. Next, we’ll clarify one of FYRLYT’s claims; halogen CRI (colour rendering index) light output (not the brightness, but the colour output) is closer to real daylight than LED and that LED light output can in fact diffuse, or make it harder, to detect objects in the 600 to 800nm – that is the orange, brownish, redish, darker end of the colour chart. Crikey, isn’t that the colour range of most of the beasts involved in animal strikes? Holy cow… or Roo, wild pig, wombat or donkey; that means the very animals we are trying to see while piloting at 100km/h are the ones that are being made hard to see by using the wrong type of driving light. Surely not! A few technicalities that need to be remembered when testing and comparing lights of different types (Halogen, LED and HID) is that brightness of light is NOT whiteness. That is, a light can be bright without being white. Conversely whiteness is not a measure of brightness. That is, a white light doesn’t mean it’s a bright light. Got it… good! Now, halogen lights being a ‘warmer’ coloured light than LED… that is not as white or blueish, may seem to be not as bright, but that’s not really the case. The warmer light can be brighter, not whiter… Got it… good! The reason I’ve outlined that very important point is it’s too easy to write of a warmer light being not as good as a whiter light… think about it. Got it again… good! That was my very first reaction when I unleashed 500W of Nemesis; they didn’t seem very white! When my brain clicked in and realised I could see a bloody lot of the road, the trees and the paddock out to the sides, both close to my vehicle as well as a long way away, I realised how good these lights really were. Being able to run multiple wiring looms with the ability to switch between halogen, HID and the LED light bar, I found myself time and time again finding everything easier to see, more comfortable to drive by and more realistic colouring with the halogen FYRLYT lights. Conversely, the LED and HID lighting effects seemed less realistic in their tinged colouring to the point that some roadside situations seemed almost fake in their colouring. Sure I could see a long way down the road with the HID’s albeit not a huge even spread pattern, and yes, the LED bar gave great spread but lacked outright range. Each time the instant-on of the Nemesis halogens were flicked into action, the more I liked them. Strangely, I felt more comfortable with the warmer glow, but still had to get my brain around the fact of being able to see just as much (if not more) as white light. The same went for my passenger during the testing: he agreed he could see more and was kinder to the eyes with the Nemesis halogen. Given the broad flooding of light of the Nemesis, that is also down to the design of the reflector, not just the light colour or brightness. The deep-dished housing has been designed perfectly to cast a blanket of anti-darkness across the track. The Australian made Nemesis lights incorporates a German-made Osram halogen bulb that has been purpose designed and manufactured for FYRLYT, hard coated lens and reflector, plus a reinforced high impact resin body. The light body fits via an aluminium billet base with a single vertical bolt for rotational adjustment plus a single horizontal bolt for tilt adjustment. A highlight of the system is that each light can be set as a spot or a spread beam via a push and twist of the bulb holder (no tools are needed), plus there’s a Gortex breather to allow air pressure equalisation as well as waterproofing. FYRLYT have resisted the use of an additional, separate lens protector to allow as much light as possible to pass through the single layer sacrificial cover, which is easily removed (without tools) and replaced if needed. The bulb is also easily replaced without tools, rounding out a light that is fully serviceable and repairable via replacement parts. Overall dimensions of the deep-dished, simplistically-designed housing and high-strength, vibration-resistant machined-alloy foot is 208mm wide by 220mm high and 150mm deep. Weighing in at 1.1kg each, the 9000 Lumen Nemesis is a good deal lighter than most other lights of this size. Each light comes complete with the DC-DC voltage converter, plug wiring and bulb and retails for $990.00 per pair. FYRLYT do have two cheaper options of a 5000 Lumens pair at $599.00 and a 3000 Lumen at $599.00 while the ground breaking 9000’s are also available in straight 24V for the trucking industry at $660.00 per pair. While, for me, the hardest part of fitting this driving light kit was the wiring as there is no off the shelf DIY wiring loom available that will handle the currant the Nemesis draw, so I allocated that job to my local Sparky. Fitting the lights to the bull bar was as easy as the old days of one bolt into the bar to adjust the direction of the light and one bolt through the base to adjust the tilt of the light – no fancy, hard to get at skeletal brackets in sight! The double pined plug is like no other, but is included in the kit and plugs straight into the rear of the light body. While the spot beam is great, once I’d tried the spread beam pattern, that’s where I’d opt to use them as there is no easily-discerned loss of distance illumination (from spot mode) plus the added sheer volume and quality spread of light is far-reaching, evenly-dispersed both horizontally and vertically so allowing for variations in road surface to maintain plenty of light where it is needed. 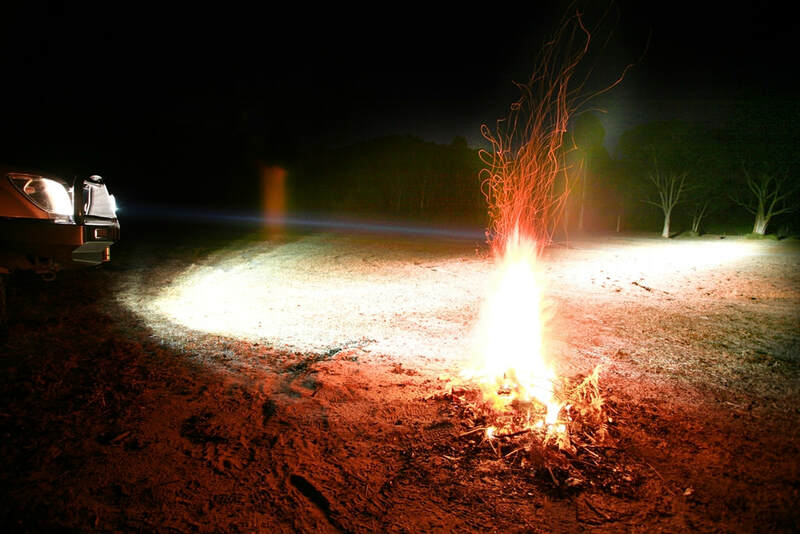 Safe night driving is all about seeing far and wide enough while hurtling along any road or track, while being able to spot any sudden attempts of errant, suicidal animals that forever seem to want to cross our paths on outback roads. Combined with major highways requiring constant flicking from high to low and back again, the halogens provided instant ‘on’ lighting, no warm up times aka HID and no (reputed) fast denigration rates aka LED. What’s all this tell us? Sure, drool over the photos as much as you can keeping in mind they never tell the complete story as well as your eyes in real life. Also, never take notice of anyone that has not actually correctly installed and driven with all the different kinds of lights for a decent amount of time. We, at 4x4 Australia have done so and I for one reckon these Nemesis 9000 driving lights won’t be moving from my bull bar – I reckon they are the best single set of lights I’ve ever driven with and I don’t see any reason to utilise additional lights or bars to get me through my long distance night drives other than perhaps some ultra-wide lighting for the odd occasion that I’d like to see almost 180 degrees. Go figure; old technology combined with a pile of smart procedures has tackled the latest and greatest high-tech world and perhaps come out on top. Although this installation was on my old 100 Series Cruiser, I've kept the lights for use on my new Troopy - they are that good! For more information see www.fyrlyt.com.au.